Next best? Cowichan is more beautiful than the famous hill towns of Tuscany? Tuscany–the setting for countless romantic novels, famed for its olive groves and rolling hills and cypress-lined roads is, without a doubt, one of the most spectacular areas of the world. But one could certainly argue that our little valley can now rival it, both in beauty and in the wide variety of produce that the land supports. That’s a really roundabout way of saying I’m grateful that I have so many local farms producing organic vegetables and fruit close by and at this time of year, I’m thankful to have an asparagus farm just down the road from my home. The asparagus shoots in this salad were picked only a few hours before they graced our lunch table. They’re oh so sweet and nothing like the ones imported from Mexico that lie wilting in the produce sections of our supermarkets. 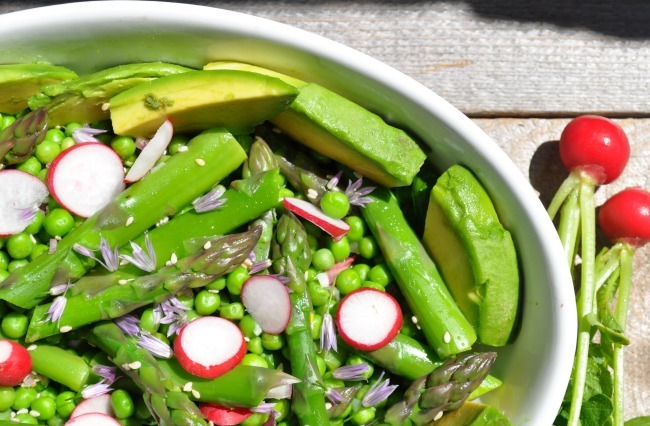 Asparagus, radishes, avocados, peas and chives–does that spell springtime to you? This salad has a perfect balance of textures and flavours and they are all mingled together with a light sesame rice wine vinaigrette. What could be better on a sunny spring day? I’ve adapted this recipe from a few I found circulating around Pinterest. Be sure to steam the asparagus lightly, just until crisp tender and bright green, then plunge it into an ice bath to stop further cooking. Hold each asparagus spear, bend slightly and snap off the tougher end piece (usually an inch or two in length) Save for making soup. Steam the spears over boiling water in a steamer basket just until crisp tender and bright green. Immediately transfer to a bowl filled with ice water. Let cool and drain. Slice each asparagus spear into 2 inch lengths. Boil the peas for 1 minute, rinse in very cold water and then drain. In a medium bowl, whisk together the shallots, rice wine vinegar, honey and sesame oil. Season to taste with sea salt. 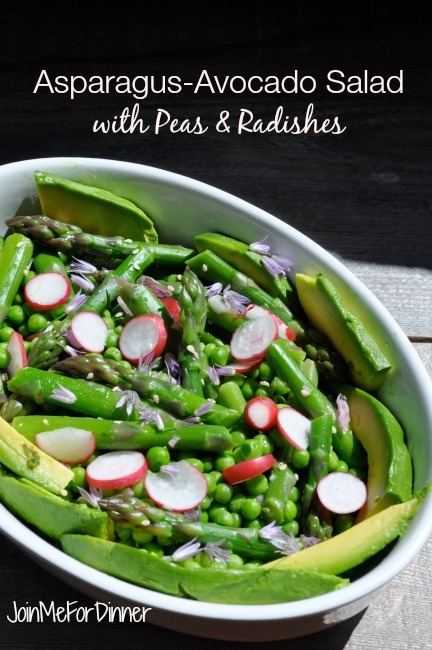 Add the asparagus, peas and radishes and toss together. Check the seasoning and sprinkle with sesame seeds. Peel and thinly slice the avocado just before serving to prevent it browning. Arrange the avocado slices around the edge of the serving platter. Drizzle with a little lemon juice if not serving immediately. 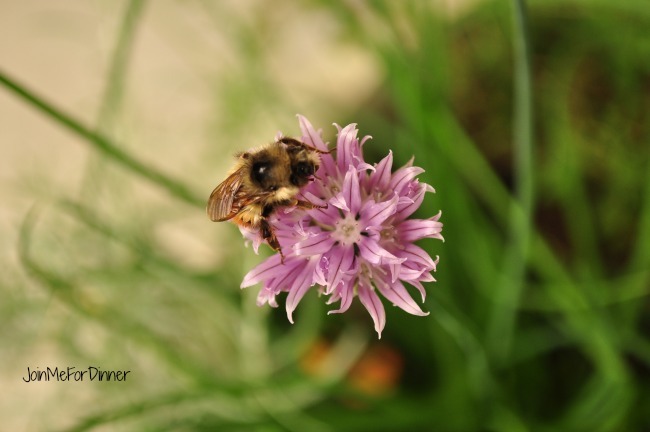 Gently spoon the salad into the middle of the platter and garnish with fresh chives and chive blossoms. Chill and serve. 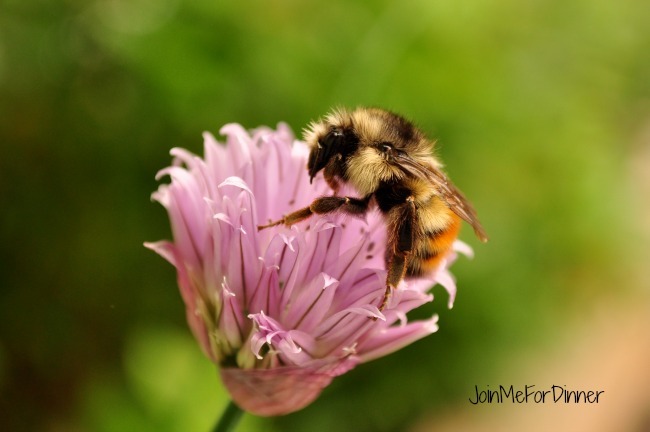 I had to wait until this little guy was finished before picking my chive blossoms! This entry was posted in gluten-free, lunch, salad dressing, salads, vegetables, vegetarian meals and tagged asparagus avocado salad, asparagus salad, asparagus with radishes and peas, chive blossoms, Cowichan Valley farm produce, radish salad, sesame oil dressing, sesame rice wine vinaigrette, springtime asparagus salad. Bookmark the permalink.